You too can be courageous in a situation – if you choose to face whatever you fear! I am grateful to this reader for his feedback. It makes me feel blessed that our experience and learnings are useful for someone, somewhere. It is only through living with fear, from feeling insecure, desperate and despondent, that I personally woke up to the futility of those emotions. When I was tired of living that way, I decided to turn around and face my situation. And, interestingly, what I feared most stopped haunting me. In fact, my worst fears have never come true and only facing my fears have made me be courageous in dark, apparently, no-go situations! To be sure, fear spares no one. Even so, interestingly, all of us have the ability to be courageous. Because courage is not the absence of fear. Courage is what fear delivers when you face up to the fear. Only when you face up to something, will you realize that it cannot harm you; only what you run away from chases you, haunts you. For instance, with a health challenge like cancer, you will feel fearful of death. But as long as you run scared of death, it will torment you. But the moment you discover that death is a non-negotiable eventuality that all of us who are born have to confront, you will no longer fear death. Then you start living. And you begin to feel blessed that at least you reasonably know how much time you have left to live. So, you start investing in the process of living than obsess with the process of dying. Clearly, fear of death has delivered to you the ability, the courage, to live simply because you stopped running away from death. So, it is with every Life situation. The more you run away from a problem, the more fearful you will be. When you face it, the problem, even if it doesn’t go away, will at least stop tormenting you. Try this approach on anything that you are dealing with presently – watch your fear dissolve and feel the courage rising in you! Let me assure you, you will feel infinitely stronger, no matter what your circumstances are! We all want to be happy but none of us wants to work toward it, for it or on it! 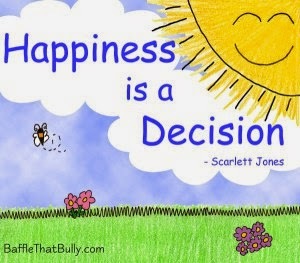 Being happy is not hard work but requires hard decision-making. But we are not ready to make those hard decisions or those important choices. Which is why we stay pining for happiness while it is pretty much within our reach. To be happy we must choose between focusing on what we have and what we haven’t. As long as we focus on what we don’t have, we will never be happy. Another reason for our unhappiness is that we don’t practice detachment. When we are aware and conscious of the reality that we came with nothing and will go with nothing, we will be detached from whatever we gain or lose in this lifetime__money, relationships, material things and even opinions, either our own or of others. From detachment comes happiness. The third reason why we don’t find happiness is that we tend to give too much importance to fear__of the unknown future, of not being around in some time, of death, of leaving unfinished business on this planet. The way to deal with this fear is to know that when we are dead, and gone, we will not even know we are dead. So, why fear something that we will never know? Also, why grieve now for a state that is yet to arrive? So, to be happy, just focus on what is, let go and stop fearing, among other things, death. There are simple choices that you can make. The harder part is to stay with these choices. That and that alone can guarantee a lifetime of happiness.